Here's one measure of the shock to the national psyche from the recent collapse: the percentage of adults who describe themselves as middle class has gone down over the past six years. 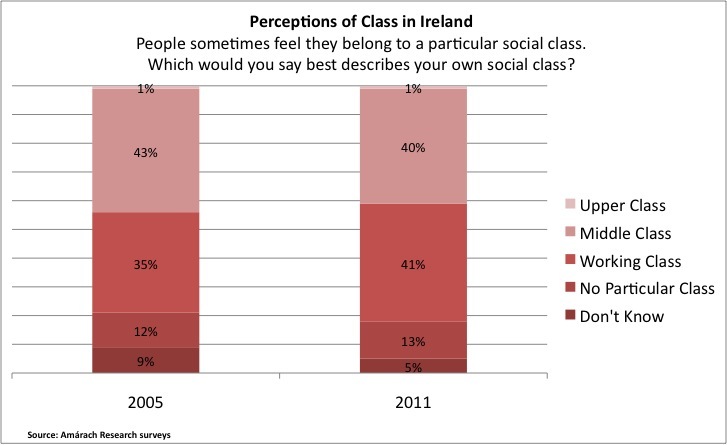 Back in 2005*, more Irish adults felt they belonged to the middle class than to the working class (43% vs 35%). 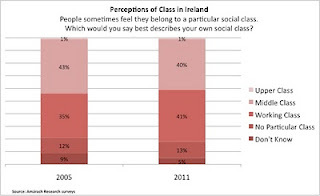 Crash forward to 2011 and now slightly more Irish people feel working class than middle class (40% vs 41%) . Curiously, it is the under 25s and over 45s who are more likely to feel middle class; 25-45s are significantly more likely to feel working class. 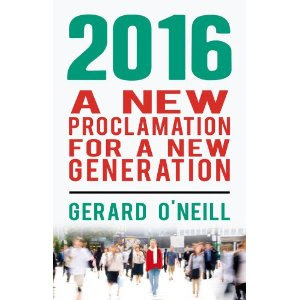 All of this suggests that social mobility has finally arrived in Ireland: of the downwardly mobile kind. Workers of the world unite, you have nothing to lose but your debts...? * based on nationwide surveys in 2005 and February 2011 by Amárach Research of 1,000 adults, quota-controlled by gender, age and social class.